Over 8000 diagrams for most every vehicle on the road. 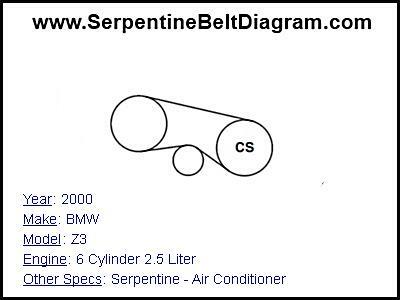 The kind of serpentine belt diagrams you will see on our site will be easily understandable diagrams for your make and model vehicle. The serpentine belt track to the right uses a tensioner and is from a 7.4L big-block. Notice that the smooth side of the belt is always against the smooth surface of the pulley. The teeth/grooves on the underside of the belt will always face toward the crankshaft, and will rest inside of the crankshaft’s track. A serpentine belt is one distinct belt, which is used to drive 1 or more devices in a car, truck, van, or SUV engine. Some of the components driven by a serpentine belt are an air pump, water pump, power steering, air conditioner, and most importantly the alternator. 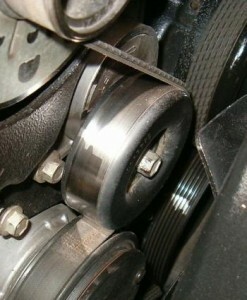 The Serpentine belt is controlled by either a serpentine belt tensioner or an idle pulley. How does a serpentine belt differ from traditional belt driven engines? The new serpentine belt, which was invented in 1979 is a much wider belt then the traditional automotive belt. This wider belt can be put under much tighter tension, which removes a lot of slippage and friction experienced by older belt systems. The major benefit to the serpentine belt is that gas mileage is increased due to reduced engine load. Even with the decreased engine load your belt will wear over time. If you have a complete belt failure you will need the belt diagrams to go along with your make and model. How to change a serpentine belt. This is a great little movie, which is done by a mechanic and explains how to go about changing your serpentine belts. He points out how most new vehicle have a serpentine belt diagram under the hood. This diagram shows which pulleys each belt goes on and how to thread the belt onto the pulleys. One good thing to note is that when replacing your belt there will be one nut that is reverse threaded ie Righty loosy Lefty tighty. Remember this is the case for most drive belt installations. Please select auto maker from the following list.